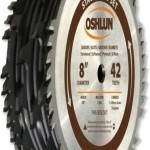 We have covered a couple table saws and one of the more common request for more information that we get is regarding the use of stack dado sets on these saws. One such example is the Bosch 4100-09 table saw that we covered that can fit a 3/4″ dado if the correct dado insert is used. What do all the dado blade sets in this list have in common? They are all 8-inch sets, they all have 5/8 inch arbors, and they all have a history of happy owners. 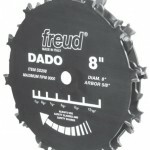 Let’s take a look at the top 8-inch dado blade sets that are worth your time and money. 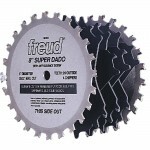 This is a 16 piece stack dado set that comes with two 42 tooth saw blades and six 6 tooth chippers. You also get a set of shims and a case. You can cut widths from 1/4″ to 29/32″ with this set. What makes these so sharp? The precision ground carbide tips. This is a really good set considering it’s somewhat entry level price tag. 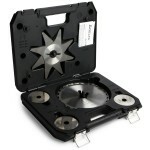 This stack dado set is well known for it’s smooth performance and splinter-free cutting result. The width range is 1/4″ to 13/16″ and can be adjusted in 1/16″ increments. There are two outside blades, two 1/16″ spacers and three 1/8″ chippers. This set also also includes shims and a storage case. If you want smooth, flat and clean dadoes then you should take a look at this affordable set. This is a great stack dado set for those requiring a super clean cut and a slightly larger width than some dado sets offer. This dado set width range is 1/4″ to 29/32″. What do you get? 2 outer blades, 6 chippers, shims, a case and also a dvd. The micrograin carbide tips will stay sharp and last for quite a long time, another nice advantage of a quality dado set. This is arguably the highest quality stack dado set on this list, and it is definitely the most expensive. This set by Forrest is well regarded for it’s super smooth cuts and excellent accuracy. 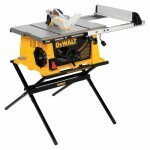 It can cut plywood with almost no tear out. Most buyers will tell you that there is pretty much no splintering on any of the cuts. It’s almost unbelievable if you are used to lower end dado sets. This dado set provides quality throughout. The blades are extremely sharp and the cuts this set produce are smooth. One thing that makes this set stand out from some others on this list is the heavy duty case. It’s a solid case. What’s in this set? Two blades, six 4-tooth carbide tipped chippers, 12 steel shims, and the heavy-duty storage case. This may actually be the sleeper on this list and it is very highly rated at Amazon. Overall, we figure you can’t go wrong with any of these sets. They are all top rated and known for their reputation as good stack dado sets.